Kona features three national parks, including one of the most active volcanoes in the world. 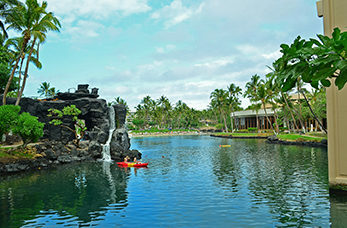 The sunny Kona Coast is a land of infinite variety, ranging from pristine beaches to rolling uplands that are home to coffee plantations and macadamia groves. Go on a thrilling expedition to see active volcanoes, dramatic lava landscapes and witness firsthand the incredible natural wonder of Hawaii. Visit the coffee orchards and learn about the harvesting, explore the coffee mills to see how the beans are processed then experience the rich aroma and flavourful taste of this unique Hawaiian coffee bean. This large natural bay is filled with coral and schools of tropical fish, there is a white obelisk on the shore of Kealakekua Bay State Historical Park dedicated to explorer Captain Cook. Explore the hidden underwater treasures from the beautiful plants and fish to the treasures of explorers who first visited Kona from a glass bottomed boat, or a submarine.